Best part: Strong’s dynamic turn. Worst part: Kidman and Firth. Amnesia – in real-life and entertainment – is a cruel, remorseless, yet fascinating mistress. Despite lacking physical pain, the psychological effects – of all temporary and permanent memory disorders – yield major consequences. For the victims and those around them, this affliction can’t simply be shaken off. In many big and small screen cases, ranging from Eternal Sunshine of a Spotless Mind to 50 First Dates, amnesia is primarily used as a valuable plot device. In Before I Go to Sleep‘s case, it guides each character’s fate from go to woe. Unfortunately, there’s much more of the latter. Nicole Kidman hiding from the critics. Before I Go to Sleep‘s crippling afflictions reside elsewhere. Born from one tiny idea, the original material turned its intricate premise into a 2011 Sunday Times and New York Times best-selling crime novel. Attracting three A-listers and an ambitious writer/director, the project could have delivered a worthwhile adaptation. However, like with several of 2014’s premise-driven productions, good concepts are met with poor results. Author S. J. Watson must be reeling from this wasted opportunity. His novel, known to book clubs around the globe, is worthy of careful analysis and lively debate. Before the conflict takes hold, the story kicks off from relatively modest beginnings. In the first shot, we see housewife Christine Lucas (Nicole Kidman) at her most vulnerable. After waking up, our main character wildly panics before darting around the house; looking for something to calm her down. 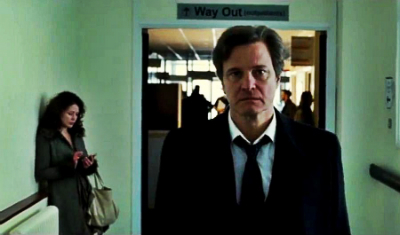 Her insistent husband, Ben (Colin Firth), informs her of her situation through trust exercises and a romantic collage. Christine suffers from short-term memory loss (anterograde amnesia, to be precise), caused by a car crash 10 years earlier. Despite the efforts to absorb new information, her brain erases everything each night. 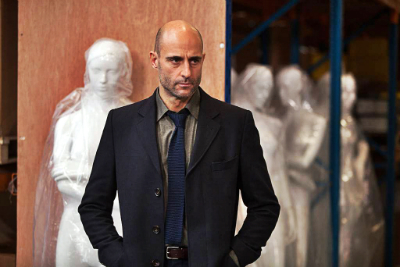 Stuck at home, Christine yearns for determined psychologist Dr. Nash(Mark Strong)’s advice. Behind Ben’s back, she develops a video diary to piece her life together. Questioning her meaningless existence, she – after suffering horrific, contradictory nightmares/memories – demands answers about the accident, the aftermath, and everyone around her. Colin Firth still reeling from Magic in the Moonlight. Writing the book whilst working as an audiologist, Watson knew how to take charge of his narrative. Carrying a firm awareness of the genre and topic, Watson should have taken control over this production. Sadly, the studio gave it to writer/director Rowan Joffe (Brighton Rock). Despite Joffe’s stature in British film and TV, the ambitious filmmaker’s sophomore effort doesn’t do Watson justice. Infatuated by Before I Go to Sleep‘s third-act twists, Joffe seems entirely disinterested with everything else. Skulking towards the last third, Joffe’s execution – creating an awkward contrast between suburban drama and mystery-thriller – is as exhaustive and frustrating as Christine’s affliction. In particular, the first half-hour – instead of establishing the pros and cons of Christine’s life – plays out like a lifeless soap opera void of subtlety, tragedy, or development. Clinging onto underwhelming revelations and dull conversations, the movie never harnesses stakes, emotional resonance, or originality. Despite the premise’s allure, Joffe’s insecure direction overplays small moments and obscures important titbits. Clinging onto the original material, his direction spells out wholly predictable twists. Following a banal relationship-drama structure, the repetitive first half might cause viewers to sigh loudly and check their watches. Bafflingly so, the movie copies and pastes concepts and sequences from similar efforts. Dr. Nash’s story-line, coming off like a gritty detective thriller, distorts the trajectory of this ridiculous psychological-drama. 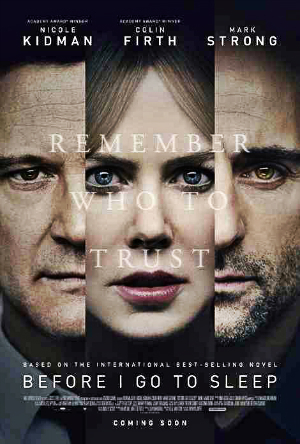 “I have to remember who did this to me.” (Christine Lucas (Nicole Kidman), Before I Go to Sleep). For once, Mark Strong isn’t playing a baddie! Despite the 92-minute run-time, Before I Go to Sleep‘s inconsistent tone and sluggish pacing cause more yawns than gasps. However, blitzing the abysmal first half, the second half switches gears before capitalising on the material. Moving the chess pieces around, Joffe’s screenplay matches the novel’s reputation; making us ask: “Who’s really trying to help?”. Switching from American Beauty to Insomnia to Memento, the movie – forming a tug of war between Ben and Dr. Nash – delivers several thrilling set-pieces and twists. In fact, its biggest twist is almost makes the first half worthwhile. Aided by Hitchcockian plot threads, the move pays homage to a long, lost form of big-budget cinema. Aided by a blistering score, muted colour palette, and Ben Davis’ sumptuous cinematography, the tension and atmosphere bolster the dour story. However, despite the compelling psychological disorder/gimmick, the movie has little to say about anything. Alienating its characters, the narrative merely hints at disability care, identity issues, and domestic violence. Sadly, Kidman – despite channeling Alfred Hitchcock’s blonde bombshells – never successfully inhabits the topsy-turvy role. Filling most scenes with blank stares and hushed tones, her subdued turn hinders the character arc. Firth, having a rough year with this, Magic in the Moonlight, and Devil’s Knot, never overcomes his character’s preposterous transitions. Despite his immense talents, the British icon seems entirely out-of-place. Gracefully, Strong becomes the shining star. Despite his underdeveloped role, the thespian delivers enough verve and guile to bolster this underwhelming effort. Whilst Before I Go to Sleep drifted from my consciousness, I reflected upon its many accomplishments and failures. Sadly, this process did little but remind me of much better psychological-thrillers. Influenced by major movies, directors, and writers, Joffe’s adaptation never lets us absorb the scintillating premise. Thanks to questionable logic, an inconsistent tone, and mind-numbing pace, this adaptation proves just how different movies and novels are. Verdict: A mindless and dreary psychological-thriller.